Melons aren't just a cool, juicy and colorful summer fruit—they're packed with nutrients, too. Watermelon, Honey dew melon, cantaloupes are synonymous of Summer. Melon fruit contains a lot of water (about 95% of the fruit) and also rich in vitamins and minerals, so it has many benefits for our health. As they contain lots of water, melons gives sense of cool and soothing effect to our body, so it can relieve heartburn and cleanse the kidneys. Melons help protect your heart, Cantaloupe reduces blood pressure as it contains lots of Potassium, watermelon builds your immunity. So what more reason you need to add these fruits to your Summer diet? I prepared this smoothie combining two melons - Watermelons and Honeydew melons with milk and served this during breakfast to my kids. A healthy and filling drinks for kids and perfect for picky fruits eaters. Smoothies either you can whip up with milk or with yogurt, that's your choice. You can also add little vanilla Ice cream, too to get a creamy texture. 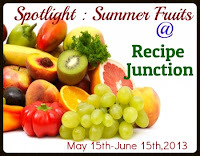 Add your choice of fruits and blend in a blender till smooth. 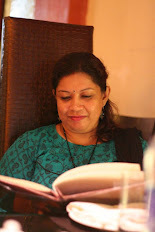 Serve on a tall glass and a glass full of goodness is ready in a jiffy. Sugar : 2 tblsp. or honey : 1 tblsp. 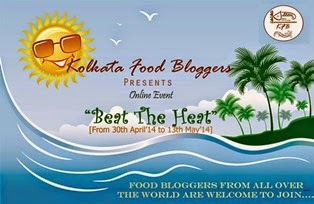 And Kolkata Food Blogger's online event, " Beat The Heat"
Fantastic and fabulous combo, both frutis are my favourite.